15% Off first Holiday Collection order at Bags & Bows! Enjoy with Free Shipping on Orders of $150 or More with code: JH208 at checkout. Get 20% Off on Custom Bags, Boxes and Tissue Papers with code: JH211 at Checkout! Get $25 Off Orders of $150 or More with coupon code: JH206 at checkout. Save $50 Off on $200 or More Orders at Sitewide. Use Promo code: JH207 at checkout! 10% Off ANY Holiday Collection order at Bags & Bows! Bags and Bows offer many exclusive designs and a vast selection of coordinating products based on their research of ongoing colors and design trends. Bags and Bows online is a premier source for retail packaging supplies including shopping bags, gift wrap, ribbons, and bows. Wrap sweet treats and other delights in the perfect packaging from Bags & Bows. 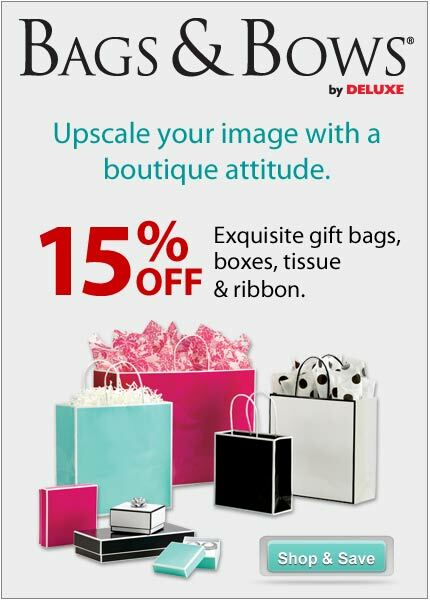 Take 15% off retail packaging at Bags & Bows Online. For jewelers, salons, spas, florists and more! Found a coupon for Bags and Bows?